Description: My kingdom for a tripod! 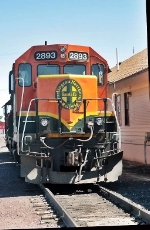 Description: BNSF's ex-MWRR interchange job is at Port Of Montana backing in the yard. Awesome consist, too bad they're not all in their pre-Heritage paint. Description: Switching the lumber mill at Avon on the Anacortes spur, BNSF 2893 began life as SP GP35 7431. Description: The Annie local pauses to work the lumber mill at Avon. 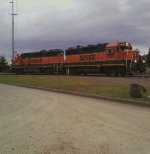 Description: BNSF 2893 in Delta Yard.